Our mental model of the world shapes our behavior at fundamental levels in ways we often can’t even recognize. I was struck by this when reading two books almost back to back, Scott Adams’ How to Fail at Almost Everything and Still Win Big and Peter Thiel’s Zero to One. Both authors lay out a schema for modeling the future and how to behave relative to it, but come to very different conclusions. Scott Adams, creator of the Dilbert comic strip, has a simple model: systems over goals. That is, it’s better to have a good system with high odds of success vs. setting a concrete goal and working towards it. In other words, get your lifestyle right when it comes to diet and exercise, don’t focus on losing X pounds to reach Y weight. This strategy implies a single worldview axis: goals-systems, with a preferred end of the axis on which one should align his personal decision making. 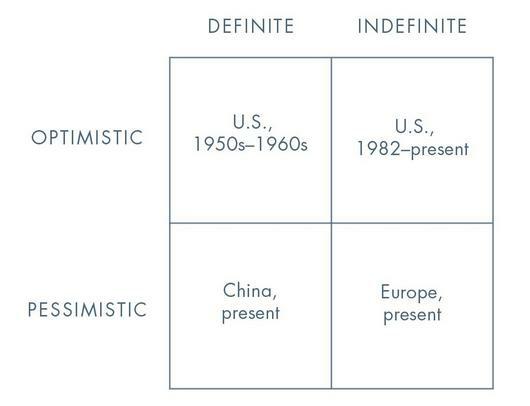 Peter Thiel future model matrix. Image via Will Price’s Zero to One review. Both Thiel and Adams are American, so reside in the top half of the chart, so let’s focus there. To Thiel, a goal is a definite view of the future. That is, you have an exact idea of what the future should be, and set about making it happen. A system would be an indefinite future. In this view, we can’t fundamentally control the future, so we put ourselves in the best position to benefit from the chance that comes our way. Now these two don’t have perfect alignment. Adams’ systems are in many cases designed to achieve results that could be viewed as a goal (e.g., a ripped physique). As a serial entrepreneur, he’s not afraid of starting companies, but does not put everything at risk while doing so. Most of what Adams would call goals Thiel would still label indefinite because they present incremental improvement vs. revolutionary change (e.g., lose 15 pounds vs. “We chose to go to the moon.”) But there’s a rough correspondence. Adams, as we saw, comes down firmly on the indefinite/systems side of the equation. Thiel says that the would be startup founder should be in the definite/goals quadrant, and believes that part of the reason America has gone off course is that we’ve shifted from a definite to indefinite view of the future. In the 1950s, people welcomed big plans and asked whether they would work. Today a grand plan coming from a schoolteacher would be dismissed as crankery, and a long-range vision coming from anyone more powerful would be derided as hubris. But perhaps you can’t understand Malcolm Gladwell without understanding his historical context as a Boomer (born in 1963). When Baby Boomers grow up and write books to explain why one or another individual is successful, they point to the power of a particular individual’s context as determined by chance. But they miss the even bigger social context for their own preferred explanations: a whole generation learned from childhood to overrate the power of chance and underrate the importance of planning. Gladwell at first appears to be making a contrarian critique of the myth of the self-made businessman, but actually his own account encapsulates the conventional view of a generation. Adams is a baby boomer, putting him squarely within this generational psychoanalysis. Is one of the two right? I think it’s more complex than that, and in part comes down to what you want, what your temperament is, and what your experiences have been in life. Thiel obviously has gargantuan Silicon Valley ambitions and an ego to match. And he’s got over a billion dollars to show for it. Adams’ success is much smaller scale – but still well into the millions of dollars, plus a significant amount of fame. He appears to be fully satisfied with his life. So at the individual level, you can succeed either way. At a societal level, Thiel may have a point, though Robert Gordon and others posit different explanations for the economic growth slowdown. In any case, the key is that how you think about the future, particularly the degree to which you can shape the future, determines a lot about the strategies you are going to use for your life. On the one hand perhaps a concentrated bet and effort to sculpt the future. On the other a more open or diversified strategy to try get the best result in in uncertain future. (I should note that Thiel says this kind of diversification is a myth, saying, “Life is not a portfolio”). I also recently read and reviewed Antifragile by Nassim Taleb. While I’m not familiar with his full corpus, his high view of randomness suggests that he’s favors a more Adams-like approach. He advocates that people should adopt what he calls a “barbell” strategy. That is, on one end you try to derisk your core life as much as possible. And on the other you place multiple, small, high risk bets with a chance of a significant payoff. This sounds like a system to me. On the other hand, Taleb also says that entrepreneurs who risk the definite should be treated with honor as heroes, even if they fail. In any case, it’s worth thinking about how we view the future. Is it something that’s primarily within our control or something that’s more dominated by outside forces or even chance? How we answer that question will determine a lot about how we go about living our lives. Wow. Antifragile, Zero to One, and How to Fail at Almost Everything and Still Win Big. I read all three of these books in the summer of 2015 (and again afterward), and I kicked around thoughts similar to the ones you’ve posted above. I began to come to similar conclusions that you have. A systems strategy is the antifragile approach. A definite optimist strategy is the fragile approach. How to reconcile them both? I like the Bruce Lee approach: Take what works, throw away what doesn’t, and make it uniquely yours. He also explicitly endorsed Zero to One, saying that Thiel is a “risk taker.” His endorsement is on the book cover of my copy of Zero to One. Taleb writes a lot about how systems become antifragile because of the fragility of their parts. Book One of Antifragile talks about this a lot. The definite optimist strategy turns one into the the fragile part that makes the overall system more antifragile. What Thiel says about “Life is not a portfolio” is cute, but it’s Arnold Schwarzenegger talk. For every guy like Arnold, who had no “Plan B” and succeeded, there are thousands who had no Plan B and failed. And we never heard from them because of their failure. We only heard from Arnold because he succeeded. But being a definite optimist definitely has it’s merits. And so does Thiel (he obviously knows what he’s doing in business). Incorporate both strategies (Systems and Definite Optimism) into the the Barbell Strategy. They don’t have to be mutually exclusive. Some people have kids. Some people have sick and poor parents living in dangerous neighborhoods. For an individual, a good “barbell strategy” CAN incorporate BOTH Adams’ and Thiel’s strategies. A man can use the systems approach at the conservative end of the barbell, and a definite optimist approach on the high-risk end of the barbell. Thank you for posting Aaron. I’ll keep track of your work! Great article, loved the seemingly contradictory approaches to life. I just finished it recently, and found a few nuggets of gold. Aaron wrote the article. John left a comment. I’m not sure you added much.. so you must be in the Adams Camp.